To the many youngsters who fell in love with England and football during Italia ’90 or older fans whose passion was rekindled that tournament, Euro ’92 was to represent the difficult second album. There would be none of the Gazzamania or nerve-jangling excitement that left millions across the nation on the edge of their seats two years earlier, nor was there an England side to feel proud of. Instead, they simply limped out of the tournament after two forgettable 0-0 draws and a defeat to hosts Sweden. 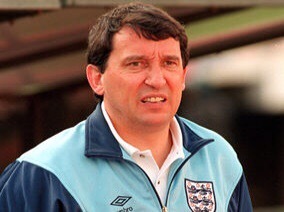 For manager Graham Taylor it was a tournament that marked a turning point in his reign for the wrong reasons and his reputation would unfortunately never recover during his time in charge. England achieved two points more than when they were whitewashed during Euro ’88, yet it is held up as a comparable failure. It would be simplifying things somewhat to say England’s failures in West Germany in 1988 were down to bad luck, but in their first two defeats to the Republic of Ireland and the Netherlands they’d at least had a proper go with several chances somehow not going in. That story would have a happy ending, Bobby Robson recovering from being lampooned to bowing out a hero two years later. But for Taylor and Euro ’92, there would be no such recovery and the tournament represented the start of things going horribly wrong. England’s cause was not helped by injuries to key personnel but they were criticised for their negativity in Sweden – they weren’t the only culprits – and Taylor was becoming a target for sections of the media. He had lost just twice in two years when Euro ’92 ended but he was under pressure and now needed to enjoy a turnaround similar to Robson’s at Italia ’90 to win over the doubters. Sadly, he would never get the chance as England failed to qualify for the 1994 World Cup. But it could have worked out differently. Taylor had led England to the finals as unbeaten group winners in a tight section including the Republic of Ireland, Poland and Turkey. Their only defeat under him so far was in a friendly to Germany and England certainly couldn’t be discounted in Sweden, for the eight-team European Championship. With only the group winners from each qualifying section having made it, this was a tournament promising high standards and little margin for error. At the draw in January, Taylor hoped to avoid Germany, the Netherlands and neighbours Scotland who had qualified for the Euros for the first time. He got his wish, England being placed in the preferable-looking group with Sweden, France and Yugoslavia. His mood was lifted further by the draw allowing them to stay in Malmo and Stockholm as he had wished. “We couldn’t ask for much more than we got,” beamed Taylor. Certainly, many seemed to share the view that England had got what they wanted and a place in the last four was the minimum target. “Graham Taylor rode his luck as England were given a European Championship draw that should give them at least a semi-final place,” proclaimed Steve Curry in the Daily Express. But being placed in the ‘easier’ group at the European Championship and avoiding the Germans was not a good omen. In both 1980 and 1988 England had received favourable draws only to crash out. No game looked a given either. France had rebuilt after being absent from the last two major tournaments and were enjoying a lengthy unbeaten run, seeing them touted as a favourite to win it. 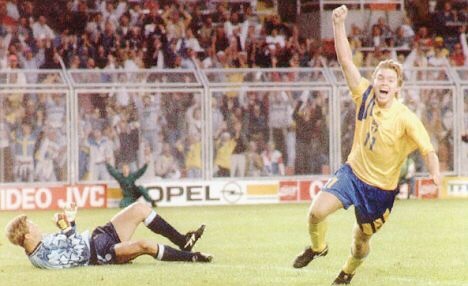 Sweden had home advantage and had finished above England in qualifying for Italia ’90. And Yugoslavia could boast an impressive collection of players who had won admirers during the 1990 World Cup. But even as the draw was being made doubts were being cast upon Yugoslavia’s participation in the finals amid civil conflict back home. Just 10 days before the start of Euro ’92 it was confirmed qualifying group runners-up Denmark would take Yugoslavia’s place. Any planning by Taylor for England’s first game against Yugoslavia could now go out of the window, but they were tipped to beat Denmark who were not held in quite the same esteem as their swaggering side of the mid-1980s. The Danes had not, contrary to the myth, needed rounding up off the beach to head to nearby Sweden but they would only have less than a fortnight to psychologically adjust to definitely being in the finals. But goalkeeper Peter Schmeichel sounded a warning to Taylor and his men. “England could make the mistake of underestimating Denmark,” he said. Graham Taylor was left to contend with a mounting injury list. With players such as Peter Beardsley and Chris Waddle having controversially been axed, England were now left short of both flair and tournament experience. The seasoned trio of Terry Butcher, Bryan Robson and Peter Shilton had all retired from international football and England were much-changed from two years earlier, but sadly not for the better. As the injuries mounted Keith Curle and Andy Sinton were drafted into the squad, but things then got worse as it came to light Mark Wright was a doubt. A club versus country row broke out over whether the injury had been held back from Taylor, but ultimately Wright was the latest to be ruled out and England failed in their bid to call Tony Adams up as a late replacement. England’s 20-man squad was already a player light and particularly short of defensive options. Although England have often been hit by injury concerns ahead of major tournaments, it is hard to think of another occasion when they had it as bad as this. England went into the finals having avoided losing games, but without convincingly winning them either. A 2-0 victory over France in February had been impressive and provided a big lift ahead of meeting the same opponents in Sweden, but since then England had drawn with Czechoslovakia, CIS and Brazil and narrowly edged past Hungary and Finland. The goalscoring form of captain Gary Lineker was proving a concern ahead of the finals and his impending international retirement. In three successive friendlies he had failed to get the goal he needed to equal Bobby Charlton’s England record and he seemed to lack some of his old predatory instincts. But it was hoped he would recapture his past form on the big stage. The tournament began with Sweden and France drawing 1-1, which suited England who would go top if they beat Denmark 24 hours later. Taylor was adamant things were going to go well. “Let me do the worrying. That’s what I’m paid for. Just sit back and enjoy it,” he declared prior to the Denmark game. But there were things to worry about, not least the lack of a recognised right back. Curle, a central defender, would play there against the Danes in Malmo for only his third cap. At the other end Lineker would partner Alan Smith, rekindling memories of their Leicester City days. Keith Curle performed as a makeshift right back for England against Denmark. Once again, England struggled in their opening game when fancied by many to get a victory. They almost came totally unstuck, as John Jensen hit the post for the Danes during the second half. “That was our moment of good fortune,” reflected Taylor after a night in which Curle had struggled playing out of position (he would never be capped again) as England laboured to a 0-0 draw. Asked afterwards to sum up his feelings, Taylor told the BBC he was “satisfied” – drawing criticism from pundit Jimmy Hill who believed the performance had been a demonstration of players earning a lot of money to demonstrate they were not masters of their craft. Taylor would later hit back at Hill, one of several instances of the England camp and media being at odds out in Sweden. “All is not lost by any means,” wrote Curry. “But Taylor has to be asked again just what he is playing at with his team selections and tactical switches.” England stayed in Malmo for their next match against France three days later, with violence in the city once more blighting an England European Championship campaign. On the field Taylor again made changes, midfielder David Batty came in for Curle, while Alan Shearer became the latest forward to be paired with Lineker. Sinton, who had so nearly missed out on the finals, replaced Paul Merson. Carlton Palmer was to play as sweeper. “The most sterile defensive international I’ve ever covered,” was commentator Barry Davies’ description of the France match in his autobiography and the cagey contest certainly lacked in attacking enterprise. Eight years earlier Michel Platini had inspired France to European Championship glory in style as captain. Now, as manager, he seemed to have fallen into the same trap as others in fearing losing during the last major tournament to apply the two points for a win system. It was also the last act before the backpass rule was introduced, with a fear of losing stinking the place out during the first few days of the tournament. England didn’t escape criticism but emerged with marginally more credit following yet another 0-0 draw, in which Stuart Pearce’s free-kick rattled the woodwork. 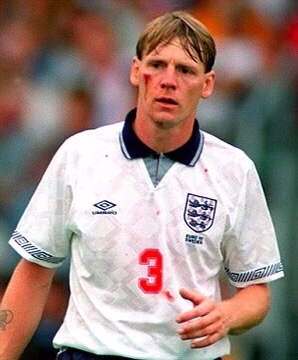 Stuart Pearce managed to keep his cool after an incident with Basile Boli. But that wasn’t what Pearce’s afternoon was mainly remembered for. Blood poured from his face after he appeared to be headbutted by Basile Boli, in an incident which went unpunished. Asked afterwards, Pearce told the media it had been an innocent incident but years later he explained why he said this when he knew full well what had happened. “Common sense told me that if I’d said it was deliberate, then the first thing they would have done is dig out all the footage of me over the years and I’d be crucified,” he said, adding he received a thank you fax from Boli for his sportsmanship. But that gesture was little consolation for England as they stared potential elimination in the face. For the fourth major tournament running they had no wins on the board after two games. “In my mind there are two games gone and three still to go,” Taylor optimistically told the media, as he remained defiant England could go all the way. To do that they would definitely have to score against the Swedes, who led the group after beating Denmark 1-0. David Lacey wrote in The Guardian that a third goalless draw would see England “flying home amid a barrage of criticism approaching the intensity of that which greeted Bobby Robson and his side after all three matches had been lost in the 1988 tournament”. But Woods was not the only player whose performances were of concern to England. Lineker had seldom looked like ending his drought during the previous two games as rumours grew that all was not well in his relationship with the manager. “He contributed in exactly the way I thought he would,” said Taylor rather cryptically after the France game. The goalscoring record was ebbing away along with England’s chances in the tournament. The match against Sweden could be his last chance. In yet another shift of system and personnel, Lineker now had no other natural forward alongside him for the Sweden match. Shearer and Trevor Steven made way for Tony Daley and Neil Webb. England had to attack and they made a marvellous start through their main goal outlet besides Lineker – attacking midfielder David Platt, who scored after four minutes. Now they had to negotiate the next 86 minutes and they would be through to the semi-finals. As Denmark were surprisingly beating France, England held top spot in the group. They successfully got through to the break with the lead intact. But half-time would offer a worrying warning sign to Taylor. In an interview 20 years later, he recalled asking the players at the break if any of them had anything to say. “They looked shattered,” he said. “The only player who said anything was Nigel Clough, who was a substitute. It really hit me at the time that we do take tired players.” Taylor’s case was not helped by the First Division having reverted to 22 teams the previous season, meaning players faced four extra games on top of multiple cup demands. Apart from the Premier League having reduced in size to 20 clubs, many of the same concerns apply 25 years later. England go behind against Sweden. Where England had excelled in the first half, they wilted after the break. The Swedes have made a habit of scoring headers against the Three Lions over the years and Jan Eriksson duly netted that way after 51 minutes from a corner. A 1-1 draw would be enough for Sweden to advance, but it would eliminate England and Taylor could see the game slipping away. Ten minutes later he made a decision that would pass into infamy. Captain Lineker was substituted, making way for Smith. England had needed to change things and Lineker was not looking his old self, but it would be a decision that led to Taylor coming under fire. If England didn’t get a goal without Lineker, then the player would never get another chance to equal the goalscoring record. To make things worse for Taylor, England seldom threatened and on 82 minutes they fell behind. A delightful link-up between Tomas Brolin and Martin Dahlin ended with the former gracefully placing the ball beyond Woods’ reach. “Brilliant. Brilliant goal,” exclaimed commentator Davies. It was a move that perhaps underlined how far this England side lagged behind, being beaten by an effort of quality. As Denmark were 2-1 up against France, an English equaliser would lead to lots being drawn to decide who went through with Sweden. But it was never likely to come and the side meekly exited the competition. In 45 minutes England had gone from top to bottom of the group. Of the 11 players England had on the field at full time, only Pearce, Platt and Des Walker had featured in the World Cup semi-final two years earlier. Injuries, international retirements and players being dubiously axed had left England looking a weak side. To compound England’s misery, they returned home outshone by Scotland who beat the CIS 3-0 and had played with honour in losing to the Dutch and Germans. As England crashed out, a previously tepid tournament seemed to spring into life with the goals now flying in and Denmark defying all expectations to win the tournament. But ultimately, it was a witty play on words that created the most lasting damage for Taylor. The manager saw the funny side of the ‘Swedes 2, Turnips 1’ headline in The Sun, but what followed went beyond a joke and did nothing to help his reputation in the eyes of the average man in the street. He was now being portrayed as ‘Turniphead’, the coverage increasingly vitriolic. Euro ’92 had not been a success for him and mistakes were made, but the personal attacks were unwarranted and they would unfortunately get worse in the months that followed. All told it had really just been a typical England European Championship campaign, as they have so often ended early and in bitter disappointment. Euro ’92 felt worse because of what had been achieved two years before in Italy and given the group England were placed in, but ultimately various factors made it one to forget for all involved. There was plenty of nostalgia in England for the 25th anniversary of Italia ’90 two years ago. We suspect we won’t be seeing much this June to mark a quarter of a century since Euro ’92. Try Denmark instead.